Big companies are finally getting beyond testing the online waters and investing some real money in social media marketing. P&G’s $1 million campaign is simply weird, and Coke’s, which relies on user generated content and YouTube, is kinda sweet. Coke is using YouTube stars in their Holiday WishCast campaign. 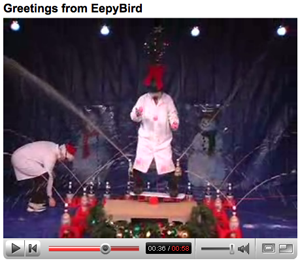 It includes this adorable video from the Coke and Mentos guys. Coke invited the six most popular YouTube users, including LisaNova, Geriatric1927 and Renetto, to create and submit video holiday greetings. Everyone else can upload theirs and send them to friends via email using video greeting cards. Then there’s P&G’s patently peculiar online campaign, “Men With Cramps”, is replete with mockumentaries featuring scientists who promise “I will make your menstrual cramps go away.” They’re actually pushing ThermaCare, which treats female menstrual cramps. If you ask me, it’s pretty lame, and rather insulting to women. But more than 11 million people have interacted with the campaign, according to P&G. The P&G campaign reeks of the heavy hand of an ad agency. Coke’s, on the other hand, is a brand and conversation builder. Not bad for a company that rejected social media not long ago, and screwed up their first efforts!